Emerging from the work of the international research program Mapping Architectural Criticism. A cartography of architectural criticism, XXth-XXIst centuries, papers are now invited for a special issue in CLARA Architecture/Recherche Journal. 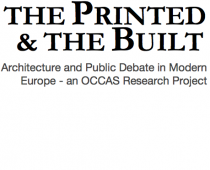 The forthcoming issue is centered on the relationship between architectural criticism and the notion of “public opinion”, the “public realm”, and on architectural criticism conceived as an autonomous discourse, internal to architectural theories and history. The volume aims to publish articles that do not consider criticism merely as a body of historical, theoretical or philosophical texts on architecture, but rather as a discipline encompassing diverse protagonists, media, and international exchanges. By posing this hypothesis, the issue seeks to challenge existing concepts related to the reception of architecture in the specialized or public debate seen as a mere passive “reflection” of the building or project. In the editors’ view, it is crucial to address the theme of architectural criticism and public debate in order to clarify the definitions of criticism and better understand the overlapping boundaries between criticism per se and other types of writings and discourses on architecture and the built environment. Criticism, historically defined as a literary genre and as a form of judgment, is bound up with the emergence during the 18th century of a space for public discussion, as the publication in 1959 of Reinhart Koselleck’s Kritik und Krise made evident. Since the 1980s, art historians or specialists in aesthetics have noted the coincidence between the development of art criticism and the emergence of a space for public debate, the latter conceived in Habermasian terms. Similarly, Richard Wittman (Architecture, Print Culture, and the Public Sphere in Eighteenth-Century France, 2007) grounded his analysis of the formation of a “public discourse on architecture” precisely in the concept of public sphere. Several other scholars have discussed the interactions between art discourse and the public sphere. Can a similar debate be transposed to the realm of architecture? And does the intersection with the public sphere tend to disappear once criticism is intended as a disciplinary discourse, mostly relying on architectural history and theories? Submission of full papers by 15 October 2017, with publication planned for September 2018. French is CLARA’s privileged working and publishing language, but contributions in English are welcome.